SAMAR – The Efren Martires Command of the New People’s Army in Eastern Visayas today told Maj. Gen. Raul Farnacio, chief of the 8th Infantry Division of the Philippine Army, not to pass the buck to the NPA over the abject failure or in fact the reluctance of the Armed Forces of the Philippines to stamp out private armies in Samar province. The EMC also dismissed Gen. Farnacio’s claim the NPA is in the pockets of corrupt politicians just like the private armies as a far-fetched fabrication. “Gen. Farnacio should know the NPA has publicly announced it has been ordered by the people’s court to arrest the two most bloodthirsty politicians in Samar province, Calbayog City Mayor Ronald Aquino and San Jorge Mayor Jojo Grey. On the other hand, said the NPA regional command, the AFP has been not only failed to crush the private armies despite much posturing, but has lately been criticized for causing mass evacuations of peasants in Calbiga. “The much-ballyhooed AFP crackdown on private armies has proven inutile in the face of their continuing killings even of women and children, particularly in Calbayog and San Jorge. Private armies cannot be dismantled without their warlords first being brought to justice. If that is impossible, it is evident the AFP is likewise defending the local tyrants who are often big landlords and warlords, and who thus remain untouchable despite their hideous crimes. These local tyrants often collaborate with the 8th ID in using paramilitaries, supporting NPA surrender campaigns, harassing the people against supporting the NPA, and committing criminal activities such as spreading illegal drugs. “Moreover, the 8th ID under Gen. Farnacio has been receiving flak over the mass evacuation of more than 500 families in Calbiga, Samar in protest over militarization. The AFP once again shows itself as no different in committing human rights violations against the people. QUEZON CITY – Despite the country’s consistent high economic growth, thirty million short-term contractual, minimum-waged earners remained a working poor as the value of purchasing power of their daily wage remained below the standard poverty threshold level, the country’s biggest labor group labor group the Associated Labor Unions-Trade Union Congress of the Philippines (ALU-TUCP) said yesterday. However, these minimum-waged earners who helped built the country’s high economic wealth are living way below standard poverty line. Their chances to get out of poverty by way of job regularization and security of tenure on employment is forever shut by the recent issuance of Department Order 174. Rather than prohibiting contractualization, DO 174 of the Department of Labor and Employment (DOLE) ‘legalize’ and perpetuate contractualization. Aside from having no security of tenure because their work for less than 6 months, contractual workers are forever tied to minimum wage. The National Economic Development Authority (NEDA) set the Poverty Threshold Level or the standard amount needed by a family of five for them to survive in a month in the year 2015 is P9,064 or P393 a day. In a monitoring made by the ALU-TUCP on the behavior of workers’ purchasing power vis-a-vis cost of living, the real value of Endo workers’ nominal P491 daily minimum wage in Metro Manila fell to P361.30 in January 2017 which is equivalent to P8,671.20 a month, according to data from the country’s wage board the National Wages and Productivity Commission (NWPC). The average real wage amount in regions outside National Capital Region, on one hand, is P250 a day or equivalent to P6,000 per month. Thus, the buying powers of minimum wages P361 in Metro Manila and P250 in regions outside NCR are inadequate compared with the P393 amount needed by a family to survive in a day. It means, minimum-waged workers needs least P32 more and P143 more on top of their daily pay for workers within and outside Metro Manila respectively to stay within the threshold and considered not poor. “There has been no inclusive growth for MWEs because the buying power of minimum wage is going downward amid rising prices of basic necessities and cost of services. Because they have no savings and inadequate government support programs, minimum waged workers are so vulnerable that if they get sick, if they get late or absent from their work, or any small price hike shocks, they fall deeper and deeper into poverty,” said ALU-TUCP spokesman Alan Tanjusay. The Department of Labor and Employment (DOLE) estimated there are 7 out of 10 of the 43 million workers are employed as contractuals working in less than six-month short-term employment receiving mandated minimum wage. Tanjusay said the ALU-TUCP offer various pragmatic measures towards helping workers cope with growing inflation. He said government should ban contractualization, provide a minimal cash amount by way of monthly subsidy while reinforcing government’s enforcement of compliance to labor and price regulations. Employers, on the other hand, could help their employees cope with poverty by voluntarily providing across-the-board wage increase and implement in-house programs providing their employees with cash and non-cash benefits, Tanjusay said. Government define poverty threshold as the minimum income required to meet food and non-food needs of a family of five including clothing, housing, transportation, health and educational expenses. CAMP LUKBAN, Catbalogan City, Samar – A tip-off from a concerned citizen on the presence of an armed group at Sitio Ogbok, Barangay Villa Aurora, Basey, Samar on April 18, 2017 prompted the troops from 87th Infantry (Hinirang) Battalion to conduct a reconnaissance patrol to confirm the validity of the information on the alleged NPA safe house. As the troops cautiously approach the alleged safe house, they were fired upon by the communist terrorists. Government troops retaliated in defense which the communist terrorists scampered in different directions. This campaign resulted to the recovery of two (2) 5.56mm M16A1 Rifles with SN 033681 and 9021623; one (1) magazine assembly (30 rounds) steel; one (1) magazine assembly (30 rounds) plastic; one (1) magazine assembly (20 rounds) steel and 48 rounds of 5.56mm ammunition. Meanwhile, in the early morning of April 19, 2017, troops from 87th IB while conducting a reconnaissance patrol within their area of operation encountered undetermined number of communist terrorists at the vicinity of Barangay Borong, Calbiga, Samar. This resulted also to the recovery of one (1) M16A1 Rifle. No casualty reported on the government side while undetermined on the enemy as evidenced by the bloodstains seen on their route of withdrawal. Your Army in Eastern Visayas Region will ensure that the armed group, with whom the government is talking peace with, will be unable to use force or threaten to use force as leverage in the negotiating table. 8ID stands ready to respond and address any such attempt by armed threat groups. Widening along Naval-Caibiran Cross-Country Road is on-going on the embankment activities and installation of scaffoldings of drainage with an accomplishment of 7% as of March 31, 2017. The projects were prioritized because of its potential for development with the vision to accommodate huge number of road users. The completion of this project will increase the capacity of the existing roads and improves the safety aspect of said sections. This road also leads to the only Provincial Hospital and Port of the Province. 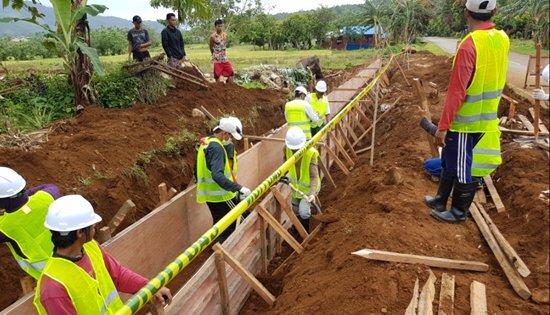 NAVAL, Biliran – The Department of Public Works and Highways (DPWH) Biliran District Engineering Office (DEO) has already started its CY 2017 Regular Infrastructure project implementation. With over P940M projects to complete this year, this district office is up for the challenge. As of March 2017, 12 projects out of 52 projects below P50M are already on its full swing. Among these projects are repair of six (6) bridges and extension of two (2) flood control structures. DPWH-Biliran DEO have also started project implementation on Turn-out (loading and unloading bays) in Kawayan,Biliran and Widening of Naval to Caibiran Cross Country Road specifically within the limits of Capiñahan, Naval, Biliran and the Municipality of Kawayan. The usual flooding that occurs along Sanggalang Highway will no longer be a problem since the project on rehabilitating the road and reconstructing a larger reinforced box culvert has already commenced. Soon this problem will just be a thing of the past. These projects are just the start and 19 more projects are expected to start on April this year. Soon, DPWH-Biliran DEO will be able to begin full implementation on the remaining projects and take up the challenge of completing these infrastructures before this year ends. 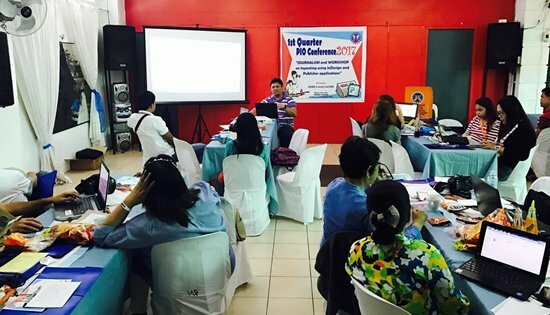 BILIRAN – Public Information Officers (PIO) of the Department of Public Works and Highways of Region VIII held their first quarterly PIO Conference/ Workshop on March 29, 2017 at Summer’s Garden, Catbalogan City. Biliran District Engineering Office were represented by Engr. Gene F. Delfin, Engineer II (PIO Alternate) and Engr. Frechbee L. Sabile, Engineer I. The workshop focuses on the topics “Journalism and Workshop on Layouting using Indesign and Publisher Applications with resource speaker, Mr. Bryan Azura, newswriter of Sinirangan News Plus. Discussed during the workshop was about the Microsoft Publisher 2010, its parts, the do’s and don’ts to make a good newsletter that can provide information of interest to the readers, and how to layout a newsletter using it. Comparison between Indesign and Publisher Application were also discussed by the resource speaker to know if which one is more advance and easier to use in layouting a newsletter. After the discussion, the participants from the different districts present their previous newsletters for the critiquing. It was found out that most of the participants needs to change their way of lay-outing the pictures in their newsletters to remain the quality of the photos. Participants were also advised not to insert the captions inside the photos so that the readers will not be distracted. According to Azura, every space in the paper is equivalent to money, thus they need to maximize their writings in the page. However, Azura complemented the participants for their organized thoughts in newswriting giving the readers an informative news. After the workshop, Ms. Antonieta R. Lim, Regional PIO II gave updates on the new DPWH memorandum and the plans for the next quarterly workshop/ meeting. The one day conference was hosted by Eastern Samar District Engineering Office and Samar 2nd District Engineering Office. MAKATI CITY – As funds for the Pondo sa Pagbabago at Pag-asenso (P3) expected to be released anytime soon, the Department of Trade and Industry (DTI) and its micro-financing arm Small Business Corporation (SB Corp) have ironed out the guidelines of its implementation that will help micro entrepreneurs throughout the country. Being the administration’s program to provide an affordable micro-financing for the country’s micro, small and medium enterprises (MSMEs), the P3 funding program provides micro enterprises an alternative source of financing that is easy to access and made available at a reasonable cost. "We’re very much excited because this is our vision in the agency – to help underprivileged by giving better chances to elevate from poverty. Through this micro-financing program, those from the bottom of the pyramid will get to climb the ladder by expanding their businesses,” DTI Regional Operations Group (DTI-ROG) Supervising Undersecretary Zenaida Maglaya said. DTI Secretary Ramon Lopez is set to introduce the national conduits and local Micro-financing Institutions (MFIs) for the P3 program. The Pondo sa Pagbabago at Pag-asenso (P3) is a P1 billion financing program intended to give MSMEs better access to finance and to reduce their cost of borrowing. The fund will also give priority to the country’s 30 poorest provinces. Following President Rodrigo Duterte’s directive to replace the “5-6” money lending system, the P3 is also seen to help stabilize supply and cost of commodities in public markets, encourage small entrepreneurs to grow their businesses, and offer employment and generate income for Filipinos. The P1 billion fund of the P3 program from the Office of the President will be coursed through the SB Corp., which will accredit partner institutions such as non-bank MFIs, cooperatives and associations to serve as conduit for the P3 funds. With borrowers identified through these, collection of repayments will be efficient. “We’re very grateful that this Program has become a reality. MSMEs now have an option to avail of cheaper funds to expand their business,” Maglaya explained. The P3 Program was launched in Tacloban in Leyte on January 25, San Jose, Occidental Mindoro on January 27, and Alabel, Sarangani last January 30. The primary beneficiaries of the P3 Program are microenterprises and entrepreneurs that do not have easy access to credit. These include market vendors, agri-businessmen and members of cooperatives, and industry associations. P3 will also make it easy for borrowers since it will only require minimal documentation requirement; easy to access with only one (1) day processing of application; low cost interest at 2.5% per month; and easy payment with collection on a weekly or daily basis, as necessary. Loan amounts to end-borrowers will range between P5,000 and P100,000, with no collateral requirement. MAKATI CITY – Philippine exports posted an increase of 11% with total sales of $4.782 billion for the month of February 2017, marking its third month of positive growth according to a report released by the Philippine Statistics Authority (PSA). For February 2017, eight out of ten top major Philippine exported goods rose with electronic products comprising 51.6% of the total exports revenue amounting to $2.470 billion compared to $2.131 billion registered in the same period last year. Other products that increased include cathodes and sections of cathodes, of refined copper (946.9%); other mineral products (107.5%); coconut oil (66.5%); electronic equipment and parts (64.9%); metal components (29.4%); other manufactures (20.1%); electronic products (15.9%); and chemicals (9.6%). United States (US) topped other Philippine export destinations for the said month, accounting for 15.6% to total exports with receipts valued at $745.22 million. It is followed by Japan with 15.25% share with revenues amounting to $728.35 million. The increase in February 2017 exports lifted the cumulative value of merchandise exports by 17.36% for the first two months of 2017 compared to the same period in 2016, based on preliminary data from the Philippine Statistics Authority (PSA). Continued export growth can be attributed to the significant increase of Philippine electronic products by 13.24% in the first two months of 2017. This stemmed from the positive performance of the six out of nine subsectors of the industry which contributed 96.74% share in the cumulative total value of the industry. Department of Trade and Industry’s Export Marketing Bureau (DTI-EMB) noted that the increasing efforts of the Philippines in strengthening ties with its ASEAN neighbors including China is expected to sustain the growth of the sector in the coming months. “Enhancing trade promotion efforts to huge consumer markets is seen as a viable strategy in sustaining the performance of Philippine exports in the coming months,” said DTI-EMB Director Senen M. Perlada. As the Philippines serves host for this year’s ASEAN Summit, the country is pushing for the conclusion of the ASEAN-led Regional Comprehensive Economic Partnership (RCEP) negotiations. RCEP is the free trade agreement being advocated by the ASEAN 10-member states with its six (6) dialogue partners including China, South Korea, Japan, Australia, New Zealand, and India. "RCEP is the chance to balance the country’s trade deficit, especially with China," emphasized Perlada. Among selected trade-oriented economies in Asia, the Philippines placed 9th in terms of exports growth, a decline after it placed third last month. Vietnam topped the list for February 2017 with 29.6% recorded exports growth, a significant increase after dropping to among the worst performers for January 2017. “We see a trend of recovery among economies in the first two months of 2017. For us in the Philippines, the numbers are healthy. While we ranked 9th for this month, on a year-to-date (YTD) analysis among selected trade-oriented economies, we placed third in terms of export growth. This is a signal of a robust export sector,” explained Perlada. CAMP LUKBAN, Catbalogan City – About 549 household from the barangays of Cambagtic, Bulao, San Mauricio, Guimbanga, Minata, Sinalangtan, Caamlungan, Binangaran, Daligan and Buluan all of Calbiga, Samar fled their respective communities to seek shelter to the town gymnasium from April 4-7, 2017. One of the Barangay Chairmen from upper barangay claimed that residents were forced to evacuate on the grounds of threat from communist terrorists that they will conduct an attack against the 87th IB troops at the said area and they were ordered purportedly by the New People's Army to troop down to avoid being caught in a possible crossfire with government troops. The passing of the villagers of Canbagtic to other barangays spread like wildfire of the above mentioned rumors which the residents panicked and also evacuated, triggering a mass exodus to the town gymnasium. Combined efforts of 87th IB, Municipal Police Station (MPS), Municipal Social Welfare and Development (MSWD) and Local Government Unit (LGU) reached at a dialogue with the evacuees to solve the current situation represented by their respective Barangay Chairmen, agreed to convince the residents to return to their community. Local DSWD distributed relief goods to the evacuees and the LGU of Calbiga provided trucks for transportation back to their respective barangays. Most of the evacuees returned to their communities but some refused and opted to stay at the covered court as of press time. Your Army in Eastern Visayas is deploying community peace and developments teams which are encouraging community based initiatives defined by the local communities, with local government units coordinating efforts against insurgency, geared towards presenting long-term solutions while at the same time addressing the immediate needs of the local community. QUEZON CITY – In a letter of allegation submitted to the United Nations Special Rapporteur on Extrajudicial/Summary or Arbitrary Executions Ms. Agnes Callamard yesterday, April 10, 2017, Karapatan submitted documentation on forty-seven (47) victims of extrajudicial killings in the Philippines under the Duterte administration, in line with the continuing counter-insurgency program of the government. The said cases were submitted a month before May 8, 2017, the 3rd cycle of the Universal Periodic Review on the Philippines at the UN Human Rights Council, a process whereby the human rights record of a country will be examined by other State. The period under review covers the last four years of the Aquino administration and the first months of the Duterte government. Karapatan also submitted similar complaints during the Arroyo and Aquino administrations. “The victims of killings are peasants, indigenous peoples and workers; many faced harassment and villification by the military because of their advocacy and actions to defend people’s rights and are thus considered as human rights defenders,” said Cristina Palabay, Karapatan Secretary General, in her letter to Callamard. Karapatan urged Callamard to consider, investigate, make recommendations and take any appropriate actions on the cases. “Despite the 2008 report to the United Nations Human Rights Council on the Philippines by your predecessor, Prof. Philip Alston, strong recommendations on extrajudicial killings perpetrated as part of counter-insurgency programs, was unheeded both by the Arroyo and Aquino governments. Throughout both administrations, political killings of peasants, indigenous peoples, Moro, workers, women and youth continued and intensified. Under Arroyo, Karapatan documented at least 1,206 individual victims of extrajudicial killing. Under Aquino, there were 334 victims of extrajudicial killing,” Palabay explained. “These killings are all in the context of the counter-insurgency programs implemented from one regime to another that supposedly seek to end the armed rebellion of revolutionary movements in the Philippines. From Arroyo’s Oplan Bantay Laya, Aquino’s Oplan Bayanihan and to the current Oplan Kapayapaan of Duterte, these counter-insurgency programs have victimized thousands of Filipinos, including struggling communities, tagged as “enemies of the State,” she further stated. Palabay said they are working with Rise Up, a campaign network of faith-based institutions and people’s organizations, in preparing similar complaints that will be filed at the UN on cases of extrajudicial killings in line with the Duterte administration’s war on drugs. Karapatan is also in the process of preparing documentation on other cases of human rights violations such as illegal arrest and detention of civilians and activists, forcible evacuation and bombing of communities, which will be forwarded to relevant mandate holders. The organization also co-convenes the Philippine UPR Watch, a network of faith-based and human rights organizations that engages in the UPR process which will send a delegation of human rights defenders to the UPR this May.